You are here: Home / Investing / TFSA/RRSP / TFSA vs RRSP – Which Account Is The Better Option For 2018? TFSA vs RRSP – Which Account Is The Better Option For 2018? One of the questions we get asked the most is around the differences between RRSPs (“Registered Retirement Savings Plan”) and TFSAs (“Tax-Free Savings Account”). 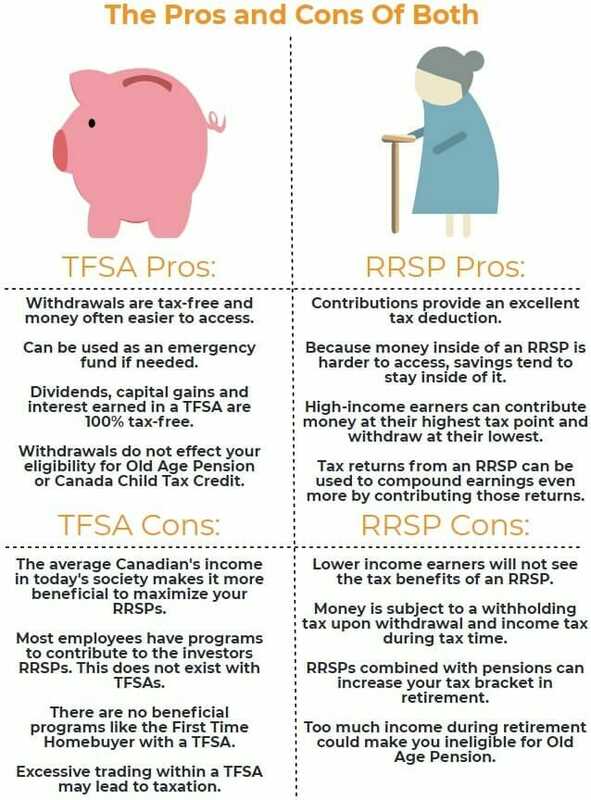 And it’s nearly always followed with “which one should I invest in first?” There is a lot of debate on which is better, the TFSA vs RRSP. We are going to highlight the pros and cons of each in this article. Before we get started, two things: first off, always consult a qualified tax professional in your jurisdiction on any tax matters. This stuff can get complicated. We don’t want to risk you making the wrong decision based on a misunderstanding. Second, we should establish one other definition. People often come to us saying things like “I bought a TFSA at my bank” or “my TFSA is giving me 2% interest.” This always gives them away – they don’t quite understand what these things are. TFSA Vs RRSP: What are RRSPs and TFSAs anyways? So let’s back up – RRSPs and TFSAs are types of what the CRA (Canada Revenue Agency) calls savings and pension plans. This just means that they’re of a type that the government via the Canada Revenue Agency designed with specific characteristics. But this also means that the government will know a few things about your registered plan: that it exists, what institution holds it for you, and specific details like how much money you have in it and you’re earning with it. The point of all these accounts whether they’re RRSPs, TFSAs, or something else has at least two parts: they give you, the investor, a tax benefit for their use and they help the government. Mainly because they encourage saving and investing. This means you’re more likely to be set up for a successful long-term financial future. RRSPs and TFSAs are not really products on their own. We prefer to think of them as baskets. You get to pick what type of fruit you put in the basket. You can put in anything from a simple savings account-type product in the basket, like a high-interest savings account at Tangerine, to shares of an ETF, all the way to shares of a private company (there are rules to this that we won’t get into here). The point is, it’s not the fact that it’s a TFSA or RRSP that gives you a certain return – it’s about the investment you have inside that basket. So, we don’t recommend thinking about RRSPs and TFSAs as individual investments. Think of them as ways to hold investments, like stocks, in a way that gives you some sort of tax advantage. TFSA vs RRSP: So what are the differences between these two accounts? There are a lot of small differences between RRSPs and TFSAs. For us, the big one is how they’re taxed. After all, it’s the way tax is applied to these CRA savings and pension plans that really matters to the owner. The difference is as simple as when the money tied to the RRSP or TFSA is taxed. For RRSPs, the money isn’t taxed until you take it out. For TFSAs, the money is taxed before it goes in. For an RRSP, you always get a tax deduction for any money you put in. If you contributed $10,000 in the 2017 tax year, and your total income on your T4 was $75,000. The CRA is only taxing you on $65,000. So we say that you are putting pre-tax income into your RRSP, and that full amount gets to earn investment income. However, down the road at retirement, that money must come out of that RRSP (or it gets converted to a RRIF, from which it is also withdrawn – more on that in another article, another time). And at that time, perhaps that RRSP is your only source of income. Lets say you only withdraw what you need to live, around $40,000. This might put you into a lower tax bracket, so that money you contributed in 2017 and are withdrawing in, say, 2057, is still taxed. The best part about it though is it’s taxed at a lower rate than it would have been in 2017. That’s the tax benefit of an RRSP. For a TFSA you put in post-tax money. The benefit? You don’t pay any tax on profits like dividends when you earn them in a TFSA. Just remember, you might be earning $75,000 a year, and you might put $5,500 in (the maximum allowed for 2017), but you won’t get any tax benefit in 2017 – your income, as far as the CRA is concerned, is still $75,000. However, the great thing about a TFSA comes at withdrawal. If your $5,500 grew to $10,000 that $4,500 profit is totally untaxed! This is the benefit of a TFSA. So to summarize, an RRSP means untaxed money goes in and it’s taxed on the way out. A TFSA means taxed money goes in, but there are no taxes to pay on the way out. However, a caveat (and life is full of caveats): there are times where the CRA will decide to tax you on profits in TFSAs. The TFSA account was introduced in 2009. Very quickly, wily traders realized they could engage in high-risk, high-volume trading in their TFSA account via brokers like Questrade. Turning $5,000 into $50,000 with absolutely no tax to pay? That’s a big win. In the end, if the CRA decides that what you’re doing within your TFSA looks like a professional trading business, they will possibly force you to pay the full freight tax rate on those earnings. We have also also seen other creative strategies used by firms and individual investors to get around TFSA contribution limits. Strategies like “stapled securities” where most of the investment principal is held outside the TFSA but most of the gains are earned within the TFSA. We suspect the CRA has also punished some holders of these securities as well. TFSA vs RRSP: What are my limits on my RRSP? The amount of total value you can hold in your RRSP increases each year as a function of your employment income and a maximum ceiling set by the CRA. In 2017, your maximum contribution will be 18% of any earned income you had in 2016, up to a maximum of $26,010. You can make this contribution anytime in the 2017 tax year. Or, up to the end of what’s known as RRSP season. This ends with the final day on which Canadians can make RRSP contributions, March 1st, 2018. By the way, that date changes every year, but a quick Google will reveal it. But this isn’t the only number that’s relevant. Any new space in your RRSP contribution maximum if unused (that is, if you don’t contribute that full amount), is carried forward forever. So you might find that you can actually contribute a lot more than just the maximum for any one year. Where do you find your unused contribution space? Easy. It’s on your CRA Notice of Assessment you get back every year after you file your taxes. Want an easier way? Simply create or log into your account on the CRA website. Why do some people not contribute the RRSP maximum? Well, likely a very large proportion of Canadians fail to use up their RRSP space because they simply don’t have the cash to spare. This is unfortunate, because we believe that Canadians already do a poor job of saving for the future. However, there’s another reason to avoid using all your contribution space. If you’re expecting your income to increase substantially in the reasonably near future, you might want to avoid contributing to your RRSP and using up that tax deduction that comes with any contribution until you’re in that higher tax bracket. This way you can save a lot more on taxes. A prime example would be a student who is doing a law or medical degree and not making much money. When they are finished, they would expect to see their income rise. It might also apply to a skilled worker who’s been laid off (oil and gas, anyone?). The exact calculus to make this decision isn’t very hard but is beyond the scope of this article. Suffice to say, it will depend on how fast your income will rise and how much. You then compare this to what kind of investment return you expect in your RRSP. Because the faster that money is invested pre-tax, the more it can accrue by being invested within an RRSP. One last point about RRSPs – you can’t withdraw money from an RRSP until you convert it to something called a Registered Retirement Income Fund (RRIF) (which has to happen before the age of 71) without being penalized. There are certain cases like the first time home buyer program where this does not apply. We’re not going to get into the details here. Ultimately the point is that RRSPs aren’t meant for you to touch them much – get the cash in, invest it appropriately, and let it grow until you retire. One final piece of advice we think applies to every Canadian is to at least be thinking about your RRSP space. Not only how much you have but what you want to be doing with it. It exists, you have it, so don’t ignore it. It’s free money, in fact, there for the taking, if you can just think long-term rather than short-term! TFSA vs RRSP: What are my limits on my TFSA? TFSAs were introduced in 2009, with a $5,000 contribution limit per year. In 2013 the contribution cap was raised to $5,500 to keep pace more or less with inflation. However, in 2015, the government increased the limit to $10,000. This was short lived as the next federal government reduced the 2016 cap back to $5,500 again. Accordingly, your total TFSA contribution space at the end of 2017 is $52,000. Unlike an RRSP, you can withdraw from a TFSA any time without penalty. We don’t recommend using them like a chequing account however. This is because any amount you remove can’t be re-added until the next year. Lets say you have $5,000 in a TFSA in 2009 and take $1,000 out before the end of the year. You wouldn’t allowed to add that $1,000 back until 2010 without being penalized. The good news is that once the tax year rolls over you get that contributed space back. You also accrue any new contribution space for the next year – so in that case you’d be able to deposit $6,000 in 2010. Any overcontributions to a TFSA will result in a penalty of 1% per month on the overcontributed amount. This is because the CRA wants to ensure people don’t overcontribute and pay a penalty less than the earnings on that tax-free investment. TFSA vs RRSP: So which account should I be investing in first? All this begs an obvious question – assuming you don’t have unlimited money what account, RRSP or TFSA, should you invest in first? It’s an important question and thankfully it’s not that complicated. It all comes down to tax rates. First off, let’s assume you’re talking about investing in the same investment product regardless of whether it’s in the RRSP or the TFSA. For example, let’s use a hypothetical target date fund that is expected to return 7% per year. And let’s assume that you intend to hold the fund for 30 years. After this you expect to retire. We’ll say you’re going to invest $10,000 of pre-tax money. Your current tax rate is 40%, and your tax rate in 30 years will be 40%. In the case of the TFSA on that same $10 000 you pay $4,000 in tax. So you only get to invest $6,000. Over 30 years, that $6,000 grows to $45,674 (it’s easy to calculate this with Excel, a financial calculator, or the basic compound interest formula), and you pay no tax on any of it because you paid tax on the initial amount. In the case of the RRSP, you get a tax deduction for the entire $10,000 you’re investing, so you pay no tax on it now. Over 30 years, that $10,000 grows to $76,123. However, once you start withdrawing it, you have to pay tax on it. A 40% tax bill works out to $30,449, leaving you with… $45,674. So mathematically, the only thing that matters in this decision at least at this level of complexity (we’re excluding things like borrowing to invest, or spousal RRSPs, and so on) is your tax rate today versus in the future. Remember that RRSPs are a form of self-funded pension. Their effect is to pay you a wage upon retirement. You need to consider what your tax rate is today and what it will be in the future. If you’re in Alberta earning $80,000 per year today, your average tax rate is 25.79% (we calculated this using this tax calculator). If you’re in Ontario earning $120,000 per year today, your average tax rate is 30.05%. Let’s just assume tax rates don’t change over the next 30 years. The Albertan might find that they only take $50,000 out of the RRSP per year. The average tax rate is now 22.54%. In this case, it made sense to use up all the RRSP space possible before switching to the TFSA. Keep in mind, sales inside of the RRSP don’t accrue capital gains until withdrawn, which is a huge benefit as well in terms of tax rates. Is your income going to go up or down in the future? A rule of thumb might be to look at your income now and consider whether it will remain that high forever. If you’re a skilled contractor working long hours, you might not earn the same money you do today once you’re older and not as able to work those same hours. In that case, all things being equal, you should probably invest via your RRSP today. If you’re an inventor, entrepreneur or on the corporate treadmill, however, you might find that as you get older, your income actually increases. You might end up with enough saved retirement capital that you end up with a higher average tax rate. In this case, it may make sense to use up your TFSA space first. It all comes down to what your tax rates are today and will be in the future. So, let’s hear from you. What do you think the best investment account is for 2018? Comment below and let us know!